In this work, we report on the thermal and thermomechanical properties of rigid PU foams modified with POSS moieties, paying special attention to molecular dynamics of these systems. 1,2-Propanediolisobutyl POSS (PHI-POSS) are used as pendent groups and octa(3-hydroxy-3-methylbutyldimethylsiloxy) POSS (OCTA-POSS) serve as chemical crosslinks. DSC reveals an initial slowing down of the segmental dynamics for small loadings (5 wt%) of both POSS moieties, followed by an acceleration, probably due to changes in the topology of the PU network and the morphology of the foam. A low-temperature mechanical relaxation is observed by DMA and is attributed tentatively to a local β relaxation, much similar to that observed in hyperbranched polyurethanes. Rigid polyurethane foams are used extensively as insulation in many applications such as walls and roofs [1, 2]; however, unmodified PU foams are highly cellular materials which are easily ignitable and highly flammable. This flammability is a factor which limits their broader use  and therefore gives rise to a demand for fire-retarding additives. Alongside traditional substances, polyhedral oligomeric silsesquioxanes (POSS) have also been tested as fire retardant additives in many polymeric systems. POSS are unique organic–inorganic nanobuilding blocks, with a rigid siliceous core with silicon (Si) atoms on the vertices and oxygen (O) atoms on the edges. Organic groups are attached on the Si atoms which allow the cage-like cores to be directly bound to polymer chains, via covalent linkage [4, 5, 6, 7]. These siliceous cages have sizes of 1–3 nm and can be considered to be the smallest possible particles of silica. In our previous work, we have incorporated these nanomoieties in a model rigid polyurethane matrix, with the intention to improve its thermostability and fire resistance. Two binding modes have been used: (1) a moiety with one functional vertex group possessing two OH groups was pendent on the polyurethane chains (1,2-propanediolisobutyl POSS, PHI-POSS), and (2) a moiety with all its eight vertex groups possessing an OH group acted as a crosslink (octa(3-hydroxy-3-methylbutyldimethylsiloxy) POSS, OCTA-POSS). The synthesis of these systems as well as their structure, morphology, and mechanical properties was described in , while their thermal stability was studied in detail in . Both POSS moieties reacted very well with the polyurethane components but the pendent one suppressed the formation of hydrogen bonds between urethane segments and thus presumably the microphase separation. The mechanical modulus increased with addition of both types of particles as a result of reinforcement and of changes in the cell structure. SEM and XRD revealed that POSS tend to form extended crystals that reside either in the bulk (PHI-POSS) or the walls (OCTA-POSS) of the foam. Although none of the moieties improved considerably the thermal stability, an analysis of the gaseous products revealed that POSS changes the degradation mechanism and also affected the formation of char. The changes were also related to the geometry of the materials, i.e. the size and shape of open cells as well as the percentage of open cells. What is still missing from this line of work is a good understanding of the molecular mobility in these systems and its relationship with their physicochemical properties. 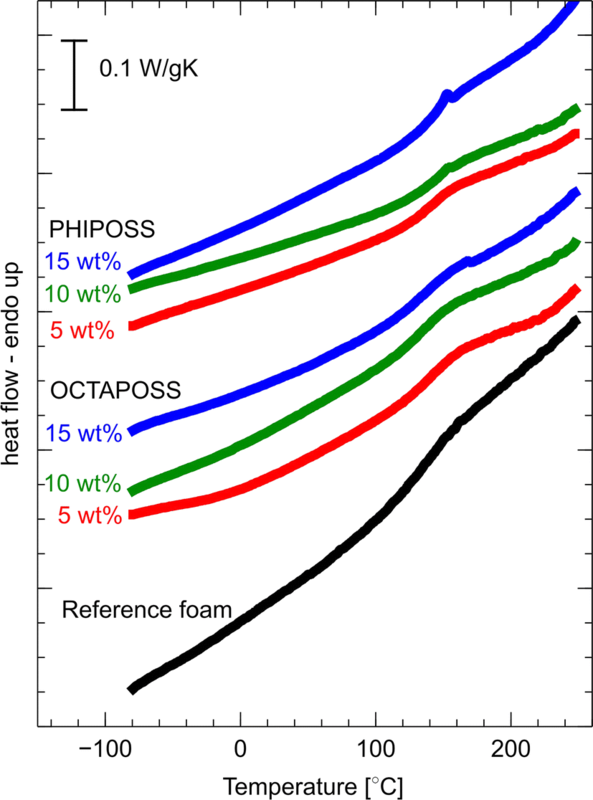 Moreover, a study of molecular mobility in rigid foams has a broader interest as such data are scarce in the literature and definitely not very well understood. For example, Hatakeyama et al. in a rigid polyol system observed significant differences in the glass transition temperatures as measured by differential scanning calorimetry (DSC) and thermomechanical analysis (TMA). The same authors later extended their measuring range to lower temperatures and detected a second glass transition at approximately − 50 °C and attributed it to the castor oil, which was one of the components they used . This is to the best of our knowledge, the only work that reports two distinct glass transitions steps. Thirumal et al. 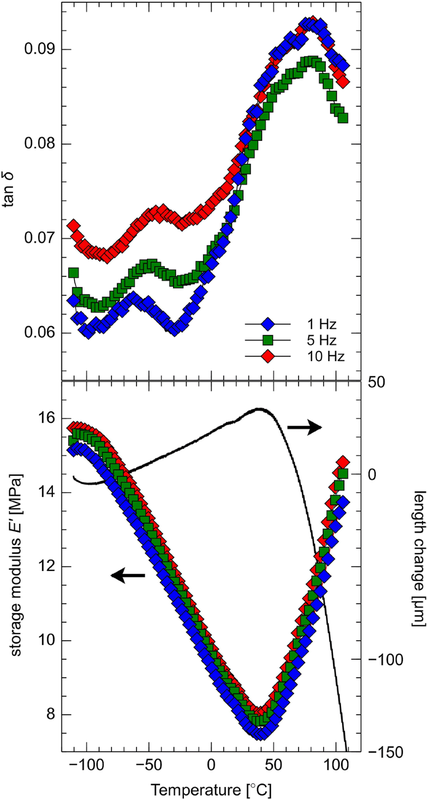 , in a system similar to ours, observed by DSC a glass transition step around 100 °C whose temperature increased with decreasing density of the foam. Generally, in rigid PU foams glass calorimetric transition temperatures are reported at temperatures ranging from − 10 to 150 °C [13, 14, 15, 16, 17]. In DMA experiments, a drop in mechanical modulus accompanied by a complex broad peak in tan δ appears only after 100 °C [14, 18]. Narine et al. observed as well a small tan δ peak at temperatures around − 70 °C which they named β relaxation and associated it with rotation of backbone chain motion of the short groups in the chain of the fatty acids used in their formulation. In the current article, we perform a short study of molecular dynamics, using dynamic mechanical analysis (DMA) and differential scanning calorimetry (DSC). We study in detail how POSS affect the molecular mobility in rigid polyurethane foams, in light also of the results of our previous work on the morphology of those particular systems. Furthermore, we crossevaluate our results with the literature trying to shed more light on the complex field of molecular dynamics in rigid PU foams. Polyurethane foams were synthesized using (1) a sorbitol based polyether polyol, and (2) polymeric 4,4′-diphenylmethane diisocyanate (polymeric MDI). A non-hydrolyzable silicone surfactant and a tertiary amine catalyst were applied as auxiliary agents. As reactive nanoadditives 1,2-propanediolisobutyl POSS and octa (3-hydroxy-3-methylbutyldimethylsiloxy) POSS were used (Hybrid Plastics, USA). Details on the reactants are given in . The polyurethane foams were obtained in a three-step process, in detail described in our previous work [8, 9, 19]. Briefly, dispersions of different POSS in THF were introduced to polyol under ultrasonic conditions, and afterwards, the catalyst, water, and surfactant were added in order to prepare the polyol premix (component A). In the next step, n-pentane as a physical blowing agent was added to component A. Then, the component A and B [polymeric 4,4′-diphenylmethane diisocyanate (PMDI)] were mixed together and stirred for 15 s. Finally, the prepared mixtures were dropped into a Teflon open mould. All the experiments were performed at ambient temperature (ca. 20 °C). DSC curves were recorded with a PerkinElmer Pyris 6 calorimeter, cooled with liquid nitrogen, and purged with nitrogen gas. In order to increase the mass of the samples that could be fitted inside standard aluminium crucibles, foam samples were immersed in liquid nitrogen and crushed to powder. Samples of 4–7 mg were used for the measurement. A first heating run at 10 K/min to 250 °C was used to remove water and erase the thermal history. During this run, a water evaporation peak was recorded, but no peaks related to microphase mixing. A cooling run down to − 100 °C at 10 K/min followed, and a final heating at 10 K/min up to 250 °C was used for evaluation. Glass transition temperatures were calculated as midpoint values. DMA thermograms were recorded with a Netzsch 242C dynamic mechanical analyser in compression mode. The compression was applied along the foaming direction on samples of 5 mm thickness and 10 × 10 mm2 cross section. The amplitude of the oscillation was 25 μm. Three rather low frequencies were used (1, 2, and 10 Hz) because during test measurements we observed that higher frequencies tended to fracture the rigid foams. Temperature range was − 105 to 105 °C at a rate of 2 K/min. Please note though that in the region around 50 °C, the samples collapsed even at the very low stresses we applied. The main event in the DSC curves is a very broad glass transition step around 140 °C (Fig. 1). As we mentioned also in the introduction, several authors have detected a glass transition step at the same region in rigid PU foams [11, 20]. Small loadings (5 wt%) of both POSS species enhance the midpoint Tg (Table 1) indicating a deceleration of the segmental dynamics, similar to what has been observed in elastomeric systems with the same particles [21, 22, 23]. Here, we may attribute this effect to immobilization of PU chain segments on the bulky POSS particles. On the contrary, upon further loading, the Tg decreases for both types of silsesquioxane additives (Table 1), denoting an acceleration of dynamics. The same trend has been also observed in very similar systems but with disilanolisobutyl POSS incorporated along the chain contour, being actually part of the main chain . There are four possible reasons for that, explaining also the counterintuitive observation that a high amount of a crosslinking moiety can accelerate dynamics: (1) The PU matrix itself is highly crosslinked and an excess of POSS particles may actually disrupt this crosslinking, even if it is multifunctional . (2) Possible aggregation of POSS at high loadings hinders the interaction with the matrix. (3) It has been observed that during the synthesis of the foams the viscosity of the polyol component increased with addition of the POSS diols [8, 19], thus a reduction in the efficiency of the reaction may have occurred, and thus a looser, more mobile network may have formed. (iv) The organic groups of the POSS moieties may be more flexible than the hard macromolecular segments of the PU-foamed matrix. We now turn our attention to secondary features of the DSC curves. For the OCTA-POSS hybrids, a wide endothermic event starts at 0 °C and is superimposed as a shoulder on the low-temperature side of the glass transition step. We may assume that it is related to the relaxation of POSS-crosslinked regions inside the foam, thus supporting the assumption that POSS actually have faster dynamics than the polymeric matrix. Interestingly, although OCTA-POSS crystals were detected by wide-angle X-ray diffraction already at 10 wt% (WAXD) , only a very weak narrow endothermic peak is observed for 15 wt% loading and around 150 °C in the studied region, presumably because of the lower sensitivity of DSC with respect to crystallinity. On the other hand, melting peaks of PHI-POSS are detected at 153 °C for all the hybrids which contain it. This is in agreement with WAXD studies that indicate more intense crystallinity for this kind of silsesquioxane . The tan δ profiles, for all PU/POSS materials, show three distinct regions in the studied temperature range (Figs. 2, 3). A weak peak at temperatures below −30 °C, a prominent peak in the vicinity of 80 °C, and a shoulder on the latter around 0 °C for the OCTA-POSS hybrids. The storage modulus E′ (Fig. 1), initially decreases in a continuous manner with temperature, but, contrary to the expected behaviour increases again after approximately 50 °C. This increase is accompanied by a significant decrease in the thickness of the sample, indicative of a mechanical collapse of the foam. Indeed, upon measurement, the sample was found irreversibly collapsed. The collapse starts at approximately the same temperature with the water evaporation peak at the first run of DSC (not shown here). It is probable that the loss of water makes the material harder and more brittle. One more factor contributing to the increase in the mechanical modulus at above ambient temperatures is the increase in gas pressure in the cells. The strong tan δ peak around 80 °C is clearly related to this phenomenon, and does not seem related to a molecular relaxation as no dependence of its peak temperature is observed with changing frequency (Fig. 2). As observed in the tan δ profiles of the matrix and the composites (Fig. 3), this high-temperature peak consists of at least two components, reflecting that more than one phenomena should be taken into account. The temperature where this macromorphological change happens, as quantified by the peak temperature in the tan δ profiles, does not change considerably with POSS type or content. The low-temperature peak shifts to higher temperatures with increasing frequency (Fig. 2) and thus may be attributed to a molecular relaxation. At 5 wt% PHI-POSS (Fig. 3; Table 1), the peak migrates to higher temperatures, i.e. the relaxation becomes much slower. With further increasing PHI-POSS content, it regains its mobility and becomes faster, even compared to the reference material. On the contrary, at 5 wt% OCTA-POSS the relaxation is accelerated, as is peak migrates to lower temperatures, but again with increasing POSS content, the peak approaches that of the pristine material. Hence, we can observe that POSS does have an effect on the relaxation, but in a non-monotonic manner dependent on the architecture of the polymeric chains. There is no consensus on the origin of this low-temperature peak in the literature. As mentioned in the introduction, in this area Hatakeyama et al. found a step in DSC which they attributed to a low-temperature glass transition. Piszczyk et al. observed in the same area a tan δ peak in flexible foams, which they attributed to a glass transition. On the contrary, Narine et al. attributed a similar peak to the β relaxation. This is consistent with the observation that polyurethanes exhibit in this area a characteristic relaxation related to the fluctuation of the urethane bond which is typically coined as β relaxation . In the next paragraph, we will try to contribute to the clarification of the origin, based on our observations. As we pointed out earlier, the peak temperature of the low-temperature relaxation varies considerably with POSS content in a non-monotonic manner (Fig. 3; Table 1). Sensitivity to the filler would be expected by a segmental relaxation like a glass transition. Changes in local relaxations are hardly expected and definitely not observed in PU elastomers bearing the same POSS moieties [21, 25]. On the other hand, a glass transition would have a footprint on the DSC curves, so assignment of the peak to a glass transition would not be justified. In addition, Narine et al. observed a shift of the peak with different polyols. Moreover, the topology of the PU chains seems to influence the dynamics of β relaxation of polyurethane, as proven by studies of hyperbranched polyurethanes [26, 27, 28, 29]. In order to shed more light on this complex situation, we construct the Arrhenius map of Fig. 4, including the data from our study, traces of β relaxations of hyperbranched PUs and elastomers, as well as the area where Piszczyk et al. 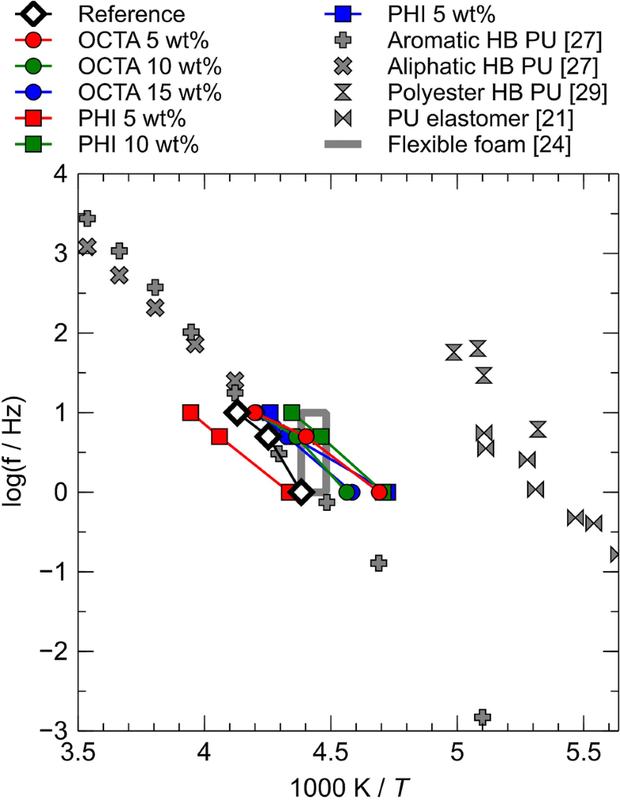 detected a relaxation in flexible foams. Indeed, the dynamics of β relaxation is strongly affected by the geometry/topology of the PU chain, and it may occur at very different regions. Calculation of the activation energy by three points is not reliable; however, we can see that the slope of the traces of our materials is very similar to the one of hyperbranched systems as well as to elastomers, which is another clue that the peak should be attributed to the β relaxation. 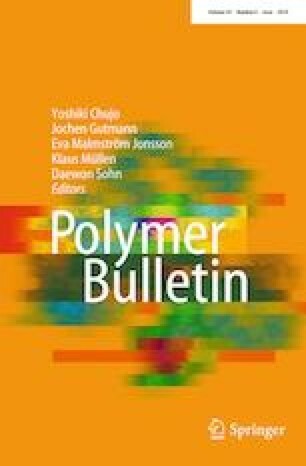 Albeit this relaxation in elastomers is not sensitive to filler content, we should keep in mind that in the foam, the environment faced by the carbonyl groups is much different than the more compact environment in elastomers, and POSS may affect it by direct interaction or indirectly, by changing the foam micromorphology. This is consistent with the much opposite effects of the crosslinking moiety (OCTA-POSS), which accelerated the relaxation, and the pendent moiety (PHI-POSS), which decelerated it. This change in micromorphology has been observed in our earlier work . Finally, the dynamics of the relaxation is known to be affected by water molecules . Thus, we may attribute the shift to the lower hydration level of the highly POSS-loaded hybrids. Nevertheless, a more detailed investigation would be needed for the clarification of the origin of the low-temperature relaxation. It is not clear if the shoulder starting at 0 °C for the OCTA-POSS hybrid shifts with frequency, thus it is not easy to attribute it to a structural change or a molecular relaxation. However, bearing in mind that it has a counterpart in the DSC curves of the same materials, we believe it is related to a transition in the POSS-crosslinked regions. We studied molecular dynamics of rigid polyurethane foams reinforced with POSS moieties incorporated in two different chain architectures, i.e. as pendent groups and as crosslinks. In the foamed PU/POSS materials, small loadings of both POSS species decelerate the chain dynamics associated with the glass transition, showing enhanced rigidity of the PU network. This is likely a result of immobilization of chains on the particles. However, further addition of POSS imposes a plasticization effect. The reasons behind this plasticization are associated with several mechanisms but the most probable ones are the disruption of the inherent crosslinking of the polyurethane, and the higher flexibility of the organic substituents of POSS as compared to the macromolecular segments of the rigid PU foam matrix. Evidence is provided that a low-temperature mechanical relaxation is associated with the β relaxation of polyurethane, whose behaviour seems to be very complex, but further study is needed for full understanding of its dynamics. DSC and DMA results reveal a complex relaxation behaviour at temperatures above ambient, e.g. a strong peak in tan δ occurs around 50 °C, simultaneously with the onset of collapsing of the samples, as observed by the shift of the oscillation equilibrium point, during the experiment and from a corresponding increase in the compression modulus as cells are destroyed and their walls get in contact. Interestingly, this happens at approximately the same temperature with the water evaporation peak at the first run of DSC. It is probable that the loss of water makes the material more brittle. This project was financed by the Polish National Science Centre under contract No. DEC-2011/02/A/ST8/00409. We are grateful to prof. Polycarpos Pissis from NTUA for kind use of DSC equipment.